In March 2004, Convic was commissioned to create the world’s largest skate park: an ambitious $25 million, 13,000m2 project. Convic’s brief for the project was: “It had to be the biggest, it had to be the best and had to be the most innovative”. 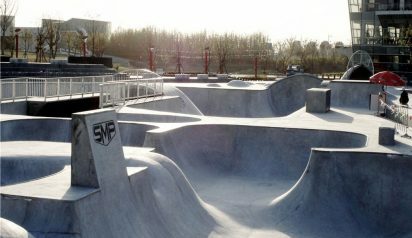 In just 18 months, Convic brought the vision of SMP management to life, consulting with Australia’s most successful professional skateboarders, converting their ideas into plans, translating those plans to Chinese, excavating tens of thousands of cubic meters of earth, pouring more than 5,000m3 of concrete and coordinating a 300-strong construction crew to complete the site for the inaugural Shanghai Showdown in October 2005. Construction at New Jianwan City, 20km from downtown Shanghai, began in sub-zero winter temperatures on a bomb site—WWII explosives uncovered on the former military air base were regularly detonated during excavation—which was partially located under the water table. 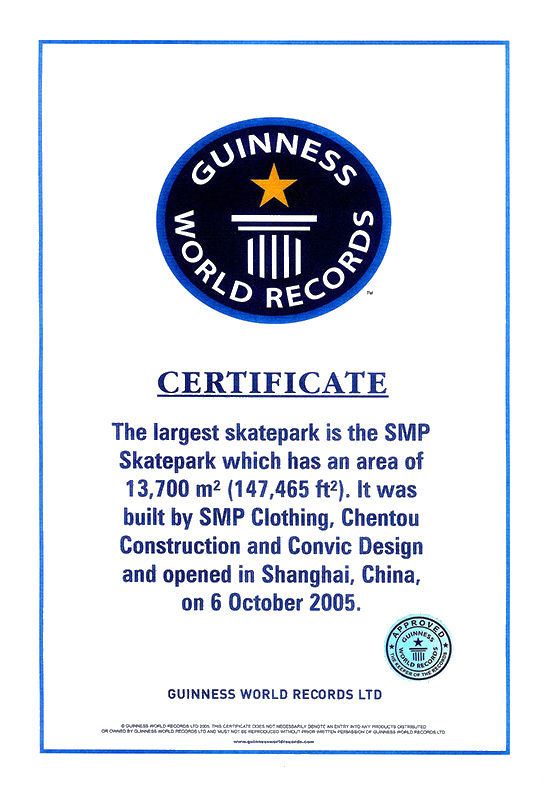 The engineering task was immense: concrete piles over 20 metres long were driven through the silt of the Yangtze River delta into solid earth before pouring a 300-500mm thick raft slab on top… over 3,000m3 of cement just for the base. 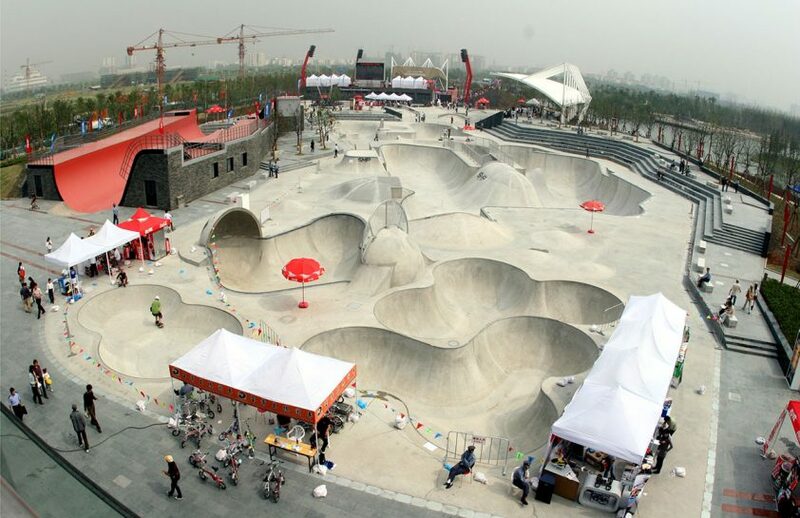 Summer’s 40 degree celsius heat presented its own challenges, as did managing a non-English speaking workforce who had never seen a skate park: the first riding surface was poured just eight weeks out from the biggest action sports event held in China. 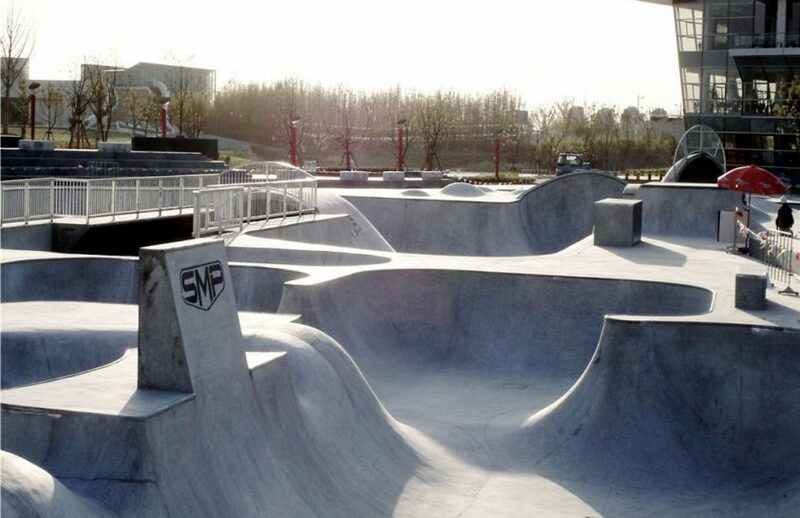 The construction company, Shanghai Chengtou, noted that Convic specified tighter tolerances than were required for the formula one track they had just completed in the city. 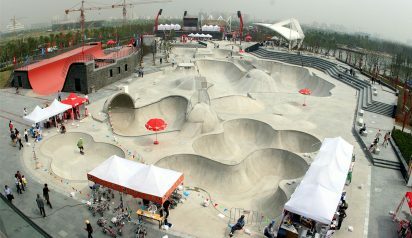 The Chinese construction team delivered, on an incredibly tight timeline, not only the world’s largest, but the world’s best skate park.